Jonathan Engineered Solutions is an ISO 9001 & AS 9100 certified manufacturer of high-quality steel and stainless steel slides. The 510QDS-SS series slide is a solid bearing slide, or non-ball bearing slide, and is an alternative to use when ball bearing slides are not recommended, or when a potential issue could arise from loose ball bearings that may be caused from mis-alignment during re-assembly. The 510QDS-SS slide is .38" wide x 1.68" tall and manufactured with 304 stainless steel. 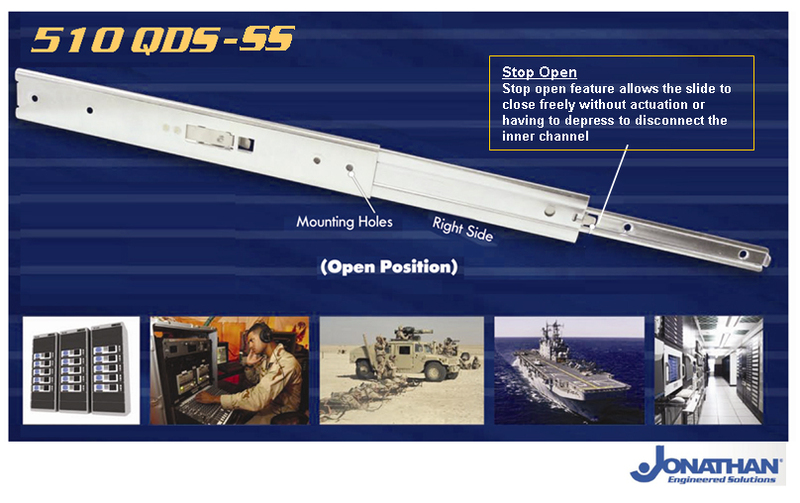 The 510QDS-SS is a 3 section slide. The slide stop opens and is provided with a quick disconnect feature. The stop open feature allows the slide to close freely without actuation or having to depress to disconnect the inner channel. Additionally, the chassis section or inner member will interchange with one another.